The word is out that the Pacific coast of Nicaragua is the new, exciting place for big game fish in Central America. Couple that with a world class hotel, marina and fantastic restaurant, and you’ve got a recipe for a great vacation! Rooster fish, sierra mackeral, jack crevalle, bonito, hound fish, snapper and grouper can be found in inshore waters. 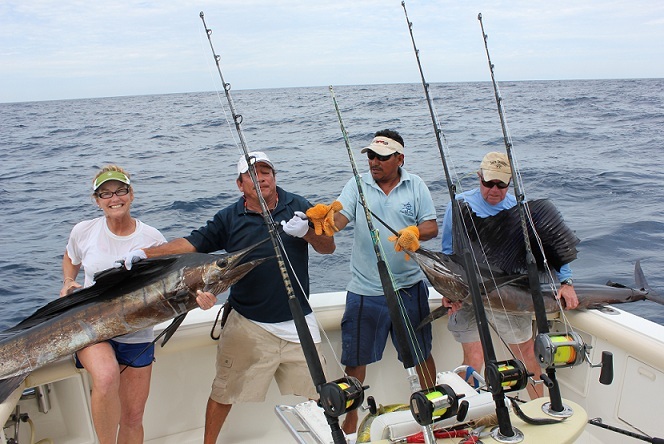 Offshore roam black, blue and striped marlin, sailfish, yellowfin, wahoo, and dorado. We offer single day trips as well as fully inclusive vacation fishing packages that can be customized to fit your every need. Because one tournament a year is not enough to quench the appetite for sport fishing competition by top anglers in Nicaragua, we will be hosting the 3rd annual Marina Puesta del Sol Tournament next year. This event includes boats of all sizes with prizes for the most successful teams and individuals, as well as special categories for ladies and juniors.